Illinois' Malcolm Hill (21) shoots a three during the game against IUPUI at State Farm Center on Tuesday, December 6. The Illini won 85-77. Illinois men’s basketball almost had another letdown at home against IUPUI. That stands for Indiana University-Purdue University Indianapolis. And its mascot is the Jaguars, so you know this team probably has not seen many wins in recent years. Besides Leron Black’s first half performance and Malcolm Hill taking over in the later stages of the second half, it was an awful game. After the Illini opened with a quick 10-0 lead, they failed to keep their feet on the gas pedal. The Jaguars responded with 12 unanswered points, and the teams would go back and forth for much of the game. 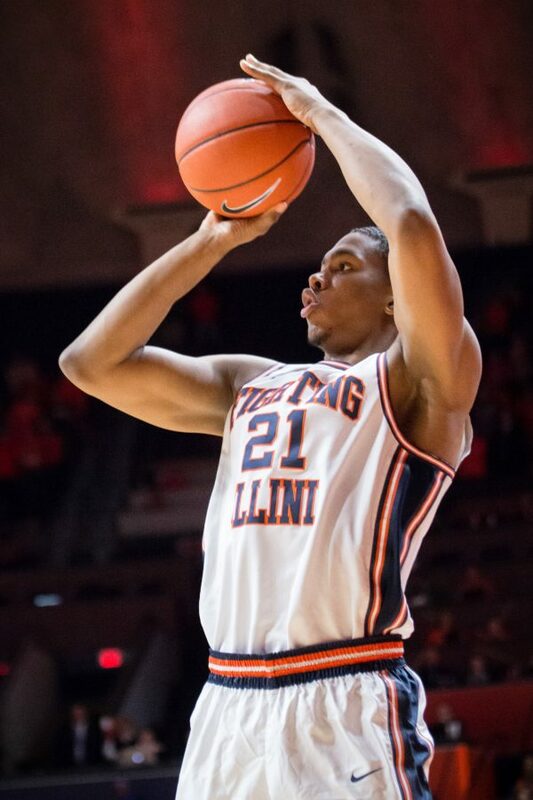 The Illini did not continue the impressive defensive game they showed against Virginia Commonwealth University, holding the Rams to 46 points. The team allowed 42 points in the first half to the Jaguars alone and too many times looked out of place. The Jaguars could have scored more points in the half but missed seven three-pointers, many of which were open attempts. In the second half, the game remained competitive with IUPUI at one point a layup away from a five-point lead. Luckily for Illinois, Malcolm Hill decided he had seen enough and took over the game. Hill finished the night with 32 points to help Illinois escape with an 85-77 victory. Sure, fans can try to lighten the mood saying that “a win’s a win”, but this game concerned me after it looked like it would be a smooth victory. Head coach John Groce had his players in the right mindset at the beginning of the game, but that message did not carry later into the game. The team cannot afford to play down to its competition for the rest of its nonconference schedule. If a team like Central Michigan or Missouri joins Winthrop on Illinois’ key loss list, the Illini can kiss their tournament dreams goodbye. An IUPUI defeat would have been the last straw for any March Madness dreams, and that almost became a reality on Tuesday night. That’s how much that Winthrop loss hurts. Even with a few key wins over stiff competition like Purdue or Maryland in the Big Ten, Illinois will have a difficult time convincing the selection committee that it deserves an at-large bid. Illinois cannot sleep in Central Michigan this weekend. The Chippewas boast an 8-2 record and are coming off a game that saw its own Marcus Keene go for 40 points. The Illini need to stay focused and keep another Keon Johnson from hurting their tournament chances.